The flu season is off to a strong start, with 21 states reporting ‘high’ flu-like activity. This year’s vaccine isn’t as effective as usual, but it can still prevent you from getting some versions of the flu. 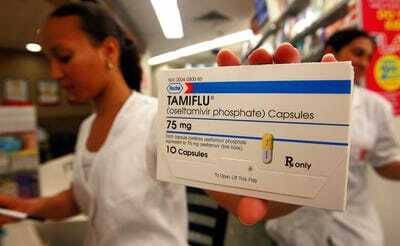 People who do catch the flu can get rid of it faster with antiviral drugs. From the California coast to the shores of South Carolina, Americans across the country are coming down with some nasty strains of the flu this year. The Centres for Disease Control and Prevention (CDC) reports “influenza activity” is ticking up across the southern half of the US, with one strain (H3N2) responsible for the majority of the deadliest, most dangerous cases reported so far.In lab specimen tests, H3N2 has been responsible for around nine out of every 10 flu cases studied. And at least twelve children have died from catching the flu this season. Influenza symptoms tend to arise pretty suddenly, and can include: fever, sore throat, cough, runny nose, chills/body aches, and headaches, vomiting and diarrhoea. Because the flu is a viral infection, antibiotic drugs are completely useless against this illness. But health experts at the CDC say there are other, proven ways to help fight the flu. This year they’re suggesting prescription antiviral drugs like oseltamivir (the pill is perhaps known better by its brand name, Tamiflu.) Other options include an inhaled antiviral called zanamivir and the injection peramivir. Antiviral drugs (which require a doctor’s orders) won’t totally cure the flu, but they can make symptoms milder and shorter, and they are especially effective if taken in the first 48 hours of illness onset. Antivirals are especially important for at-risk patients, including: kids under 2 years old and adults over 65, pregnant women, people with asthma, and patients with weakened immune systems. Healthy people can typically recover from the flu in less than two weeks with rest, fluids and pain relievers like acetaminophen and ibuprofen, but antivirals can help prevent more serious complications, like pneumonia. And if you’re not already home fighting off the bug, it’s still a good idea to get a flu shot if you haven’t. The CDC estimates it prevents about 5 million flu cases annually across the country and says it’s not too late to get your dose.